How I suffer. I get called the Windows apologist, the Windows fan-boy, Gates-Junior. Occassionally colleagues ask ‘is there nothing that annoys you about Windows?’ And when they ask, the flood-gates doth open. How much time can you spare? Over many years, spent in windowless rooms (irony!) conducting user testing, the Microsoft’s User Research Group repeatedly try to crack the problem of making computers easier to use; repeatedly change the Windows user interface and repeatedly fail. Call me suspicious but is user research, like Beta releases, more about crowd-sourced bug-finding rather than listening to genuine feedback? It seems that the Windows 8 Beta is being met with hands over ears and a loud ‘blah blah blah, I’m not listening’ over in Redmond. Once again, it seems Redmond knows best. Of course. Look at the track-record. Windows. Apparently the human brain is incapable of handling overlapping windows, so Microsoft overloaded the desktop with translucent borders, AeroSnap, which pulls windows to the edges of your screen as you move them and a variation of Alt-Tab switching that makes all your windows vanish if you hesitate too long. And some of these don’t work if your graphics card is cheap. Search. We all have too much ‘stuff’, which is why Windows Explorer has a search box in the top-corner. Sadly, the search tool in Windows 7 doesn’t work too well – slow to run, returning incomplete results, the interface is no better than Vista and frankly I miss my Search Puppy from Windows XP. The animated puppy was irritating but the search function worked quickly and effectively. so you couldn’t find anything at all. Internet Explorer. IE has been getting more and more radical make-over’s with each version, which is why IE10 now has half the controls hidden around the back of it’s surgically-stretched head but behind the botox, it is no more secure than the first version. Thanks to the complexity of the Windows software stack and it’s interation with disparate hardware, Microsoft is unable to resolve the Blue Screen of Death, even in Windows 7. But so it’s not lonely, Miscrosft gave it a baby brother, the Green Ribbon of Death, so that you have something colourful to look at whenever Windows Explorer suffers a breakdown. User Account Control (UAC) in Vista developed a case of OCD so severe, that it popped up about every thirty seconds, repeatedly asking your permission to do something you already agreed to but didn’t understand in the first place. 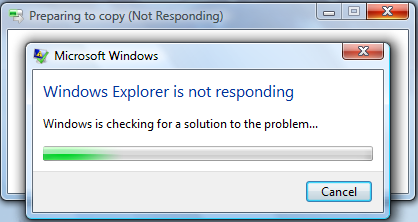 In Windows 7, the requests are less frequent but it intermittently breaks older applications. But UAC itself isn’t broken, it’s designed that way. Of course, you may have a genius level IQ, proven by your intelligent choice from the six or seven versions each of XP, Vista or Windows 7 that went on sale. You may have rooted around in the multiple level of control panels to adjust all the settings that kill some (but not all) of these ‘features’. You may have adjusted your way of working (i.e. your way of thinking) to work with Windows, rather than it adjust to work with you. Or, like the rest of us, you may have sighed in resignation, sworn at it in frustration, or foresworn the whole thing and bought a Mac. Good luck with the thought-police using that one. The truth is Windows does more, for more people, on more machines, with more hardware and more applicaitons than anyone could have dreamed back in the days of MS-DOS version 6. It is a de facto standard and at least you have some idea how to drive the thing when you sit down in front of a strange computer anywhere in the world. Its a license to print money. Don’t expect them to stop any time soon no matter how they screw it up.